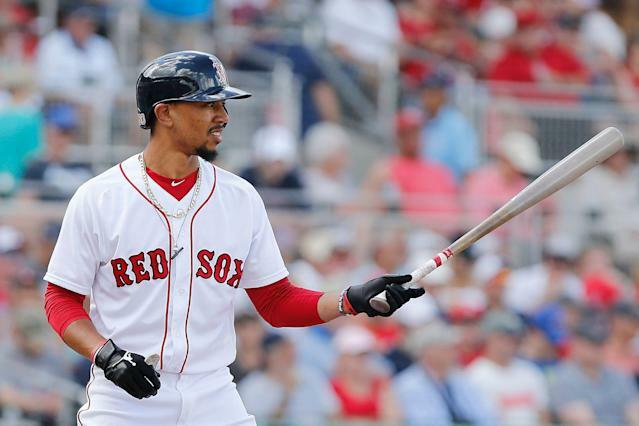 Betts’ belief that he’ll eventually hit the free-agent market has nothing to do with playing in Boston. In fact, Betts said he loves being in the city. For Betts, it all comes down to being valued properly. As Alex Speier of the Boston Globe points out, Betts has disagreed with the Red Sox on his value in the past. The 26-year-old waited out the Red Sox after he was drafted to receive a better contract, and took the team to arbitration — and won — in 2017. Betts, who won’t become a free agent until after the 2020 season, has a good reason for waiting things out. Generally, players who hit the free-agent market get bigger deals than the ones who sign extensions. This is due to the player having a bigger market for their services. On the free-agent market, all 30 teams can bid against each other for Betts’ services. During extension talks, only the Red Sox can negotiate with Betts. Since the team knows it doesn’t have to outbid other suitors, it can try to sign Betts to a deal below his market value. While an extension for Betts seems unlikely, he didn’t rule out the possibility, but only if the Red Sox are willing to meet Betts’ value. After Mike Trout signed a 12-year, $430 million extension Wednesday, Betts’ value is going to be astronomically high. In his four full seasons in the majors, Betts has managed three top-6 MVP finishes. He won the award in 2018 after hitting .346/.438/.640, with 32 home runs, over 614 plate appearances. If Betts can continue to produce like he did in 2018, holding out for Trout money — or even something better — won’t be an unreasonable ask. A lot can change between now and November 2020. Like the Los Angeles Angels did with Trout, it’s possible the Red Sox will make Betts an offer he can’t refuse. It’s also possible Betts finds the allure of free agency too tempting. Once he gets there, the Red Sox won’t be able to pin their hopes on Betts taking a home-town discount. They’ll either have to meet Betts’ demands, or be willing to pay as much as everyone else.